I recently posted a photo to my teaching instagram (@lovespedteaching...find me!) joking that I was scoping out CBI (community-based instruction) locations, when in reality I was laid back at the beach ;-) I really believe that I could make a pretty good case for beach life skills training, but that's a different post entirely. Today, let's discuss how CBI trips should be selected! A few years ago, I became the CBI coordinator for my district. 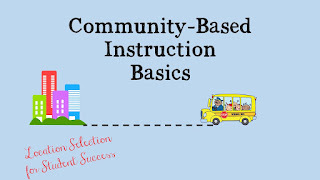 Basically, this means that I am in charge of maintaining the CBI manual, coordinating bus pickup with the transportation secretary, and helping provide my fellow self-contained teachers with resources for use on trips. 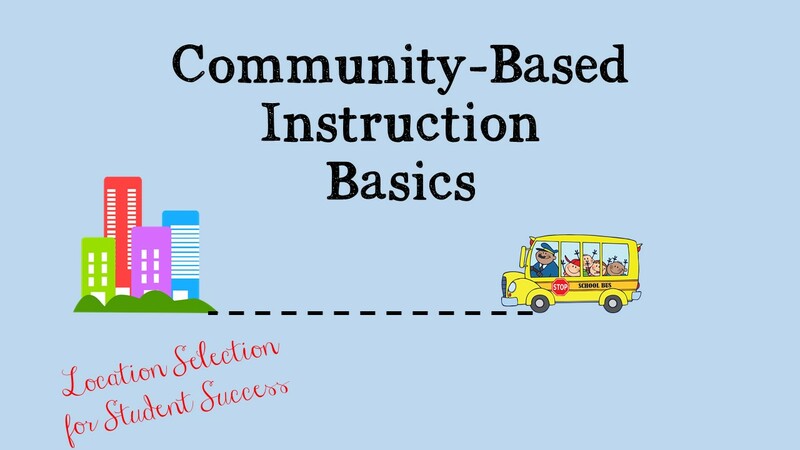 When I started looking into the habits of my district as well as those in neighboring counties, I realized that all too often CBI trips are treated as field trips, when they are very different by definition. Very little planning was going into the selection of locations and very little intentional teaching was happening while on the trips themselves. The trips were full of teachable moments and I applaud the educators for taking advantage of those, but I believed we could do a little more to take full advantage of the opportunities provided! So, how do I select CBI trips for my group? Sometimes, especially in the upper grades, we plan for community experiences by setting community-based goals. Other times, it is beneficial to think outside the box! Your student may now be able to differentiate between upper and lower case letters using the file folder game that you created and worksheets you provide, but will he be able to pick them out on the McDonald’s sign? Perhaps she can add 1+2=3 on paper, but what if she wants a cookie and her two friends want a cookie; will she know how many cookies to purchase? Also, it is possible to monitor related service goals in the community setting as well. Perhaps he can transfer from his wheelchair to the chair in your classroom, but what about transferring to a swing at the park? As with everything we do, start with the goals! Are the same or similar to the sites currently used by the student or will most likely be used by him/her in the future. Will help you provide systematic instruction that is consistent with family expectations and desires. What do parents want them to be independent doing? Are there any restrictions that parents set on community locations? Facilitate comprehensive, longitudinal instruction and consistent methodologies.We aren't all over the place in the classroom and should also not be all over the place in the community. Focus on future living arrangements and desires upon exit from the school system. Postsecondary success is on the forefront of a high school teacher's mind, but this is a good tip for younger grades as well. Keep the end in mind as you help students take small steps toward the eventual goal. I keep a working list of accessible stores, restaurants, and activities within our allowed driving distance along with estimated money needed for each location. This helps make planning time more productive. Don't stress over it: if you have selected a place that is accessible and will help you work on at least one goal per student, go with it! I have definitely taken my students places and come back to scratch it off the list, but then there have been some locations that I am skeptical about that proved to be wonderful! Give yourself the freedom to try and give yourself grace if you select a location that proves to be a "fail". We've all done it...we'll all do it again!